Somehow, just seeing the red door, I knew. I don't know how I knew. But I knew. We had arrived at the right place. And the funny thing is: I hadn't even planned on seeking the tango. 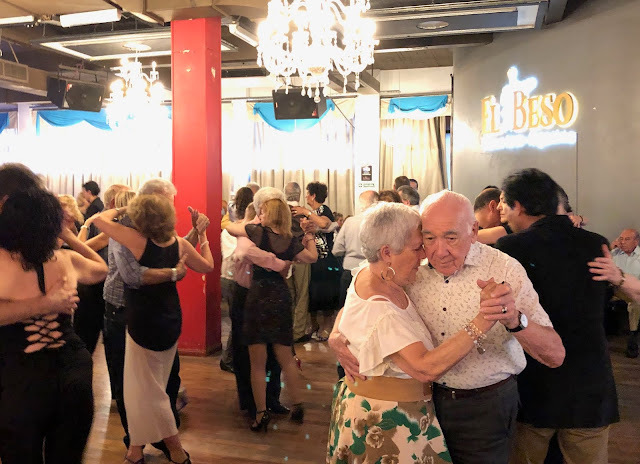 Oh, I knew the Latin American dance was there, in clubs all over Buenos Aires, where it began at the end of the 19th century in taverns and brothels, moved to Paris, then returned to find upper class popularity just before World War I. But tango today, in my mind, was associated with single friends bravely filling their evenings with dance lessons and older married couples performing a pantomime of romance in their declining years. In other words, I thought I knew. But I didn't know. At all. Luckily Michael, the friend I'm traveling with, raised the possibility: we should go see some tango. I, nothing if not accommodating, flipped open my laptop and began to search. Some places were too hip, or offered "shows"—Las Vegas-like tango reviews—geared toward tourists. Pass. Then there was El Beso. I liked the name, "The Kiss." I jotted down the address: Riobamba 416 in the Villa Crespo neighborhood. Maybe we would go. It was about 3 p.m.. After the triumph of the walking tour and a restorative coffee and snacks, we figured, why not slide by? The cratering Argentinian peso means we could take a cab anywhere in the city for about three dollars. Go, see, if it wasn't anything, just shrug and come back. I saw the sign. I saw that door. I ceremoniously shook my Michael's hand, then pulled open the door. We went up the staircase. The music hit us first. A sinuous rhythm from above. Then the single square room, neither large nor small. Bright chandeliers, yet somehow a little dim. I paid the entrance fee: $4. Patrons sat in two rows of chairs bordering the dance floor, studded with small tables. The average age was 65 to 70. The music was recorded. Everyone seemed to know each other. As in high school, the boys sat with the boys, the girls with the girls. Some couples sat together, including an older woman with a slickly handsome man in a sport coat, 25 years her junior. Daniel Nacucchio and Christina Valeria Sosa. "Maybe a son taking his mom on the town," I suggested. But there was another, nearly identical serpentine man, also in a suit coat, who was just sort of there, sitting, scanning, poised, as if waiting. Could it be...? The dancers slid and spun, embraced and turned. Hands splayed across shoulders, rested securely across waists. It seemed half the dancers had their eyes closed, yet everyone kept the proper distance, all functioning like some room-sized human clockwork, every part doing the proper motion in steady syncopation. An hour went by. I drank a Coke. 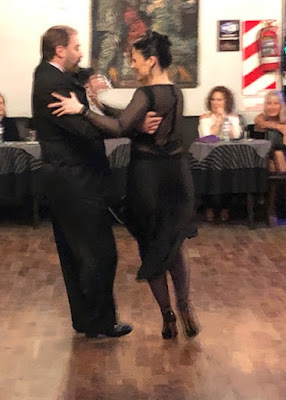 There was a tango demonstration. Daniel Nacucchio and Christina Valeria Sosa. They moved slow and fast, stopped then began again, in perfect unison, both rising on their toes, then sliding a leg back. Nacucchio had a look of calm concentration, Sosa smiled brightly. The room applauded. We didn't want to leave, and indeed, there was a sense that time had stopped, here, and if we only remained then the years would melt away outside while here the tango would go on forever. But eventually decided we had to go, and slowly worked our way out of the room, edging past the dancers, reluctant and elated. Somehow I felt I had glimpsed a path into the future. A navigable route up the painful mountainside. This is how one grows old: with dignity, companionship, music, and dancing. It can be done. These people are doing it. There was a restaurant nearby, La Esperanza de los Ascurra, and we repaired there to eat dinner and savor our triumph. A friendly bartender, Maria Soto, a young Venezuelan who fled to the relative stability of Argentina, served our drinks and made conversation. I told her we had just been to El Beso to see the tango. "But did you dance?" she asked. No, I explained, it was our first time, and we didn't know the proper custom for asking someone to dance, did not want to give offense and, besides, we didn't know how. "You have to try it," she insisted. "The life is only once." When the Russians were besieging the German Sixth Army at Stalingrad, they blasted tango music, on the theory that it was sinister and demoralizing. An odd choice, but under those circumstances, I would have found the "Mr. Rogers" theme demoralizing. Being in a foreign land and walking through that red door, taking in the scene before me, the music and dancers, the electricity flowing, would have bowled me over. Excellent piece of writing, putting us right there. "Somehow I felt I had glimpsed a path into the future. A navigable route up the painful mountainside. 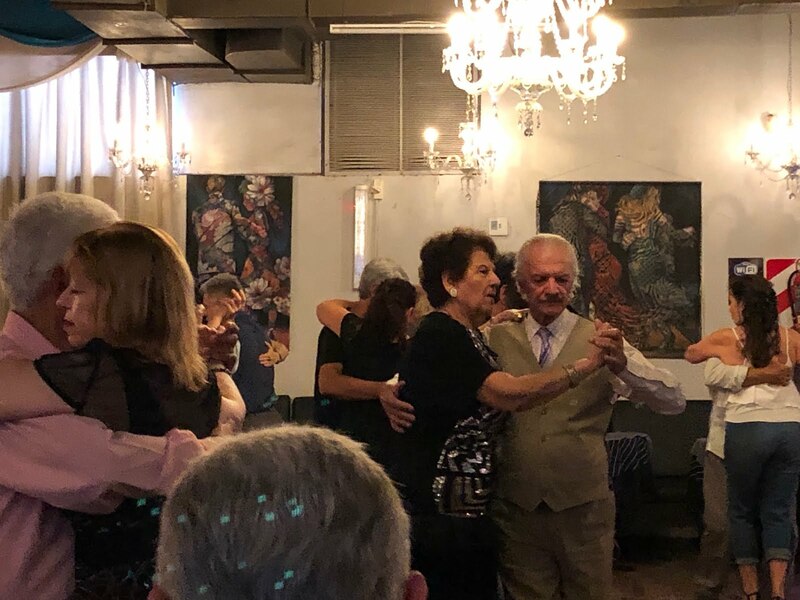 This is how one grows old: with dignity, companionship, music, and dancing. It can be done. These people are doing it." Early Boomers, aged 65-70...and beyond, are doing it, too. Right here in America. There are live bands that play nothing but the Top 40 hits of the Fifties and Sixties, the tunes that Boomers listened to on AM radio in cars and bedrooms, and bought 45 RPM recordings of, and danced to at sock-hops and basement parties. My wife and I have been dancing to one of those local bands for almost twenty years. And yes, it does feel like time has stopped and the years do melt away, and the "doo-wop" sound we grew up with goes on forever. But there's no swapping of partners...you always dance with the one who brung ya.